Complete fence system contains all the essentials to keep your pasture piglets and pigs in, or to keep the nearby feral hogs out. 24" tall. 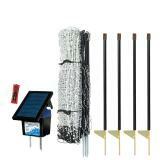 Net sets up as Pos/Neg for dry, rocky, sandy or winter soil conditions. This aids in overcoming poor soil conductivity. For fencing piglets and adult pigs in the pasture. An excellent starter kit for keeping feral hogs out of gardens or away from lawns. 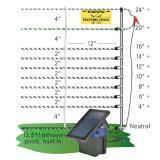 100 ft roll of 24" HogNet® single spike electric netting creates a 25' x 25' enclosure. 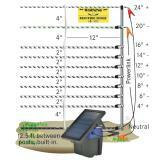 HogNet® 10/24/12 is a 24" electrifiable prefabricated fence. It arrives at your door as a complete roll with the single spike posts already built into the mesh/fence. Features 10 electrified horizontals strands with vertical struts placed every 12". Add 3 more rolls (Item #208066) to create a 100' x 100' enclosure. 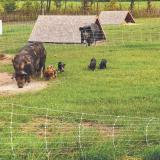 To train, set up HogNet® fence alongside (1 to 2 ft away) a secure permanent fence that the pigs can’t get through. Make sure the netting is electrified—at least 3000V at the end of the fence. Introduce the pigs to the fence and monitor for a few hours. Easy to put up and move. I’m using fence to rotate pigs to fresh grass. Also using it to keep wild pigs out, I’ll follow up on how it works out. This was the answer to our piggie problems!! From box to complete fence took only 30 minutes. This little set up was fully explained on the "how's" and "why's" and keeps our little pot bellied pig in the yard where she belongs! If I had larger animals needs, I wouldn't shop any where else. Awesome product.